“Legend goes that there was an epidemic in North China long ago, and doctors could not do anything about it. So the Moon Goddess sent her rabbit to earth to treat the disease. However, because the rabbit is white and ‘the white color was actually related to death in the past, people did not allow the rabbit to enter their houses to treat the disease. The rabbit realized it and went to the temple to borrow the outfit of the saints. That’s where Rabbit God’s look is from. People began to revere him after that. Nonetheless, there are other legends with all of them holding the same reverence to the Rabbit God. Historical records show it first appeared at the beginning of the Ming Dynasty (1368-1644), and thrived in the middle of the Qing Dynasty (1644-1911). Almost all the households, the royal family and common citizens alike, were offered sacrifice to Rabbit God during the Mid-autumn Festival. 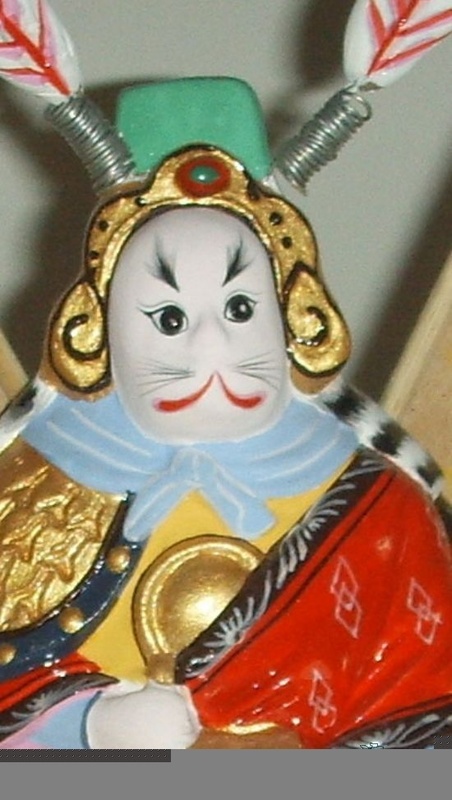 Of the figures we see today, Rabbit God sits on a variety of things, ranging from Kylin, tiger, elephant, lotus, to peony. Lotus is typical to Kwan-yin, a Buddhist god, making Rabbit God a more sacred figure, while peony symbolizes wealth. 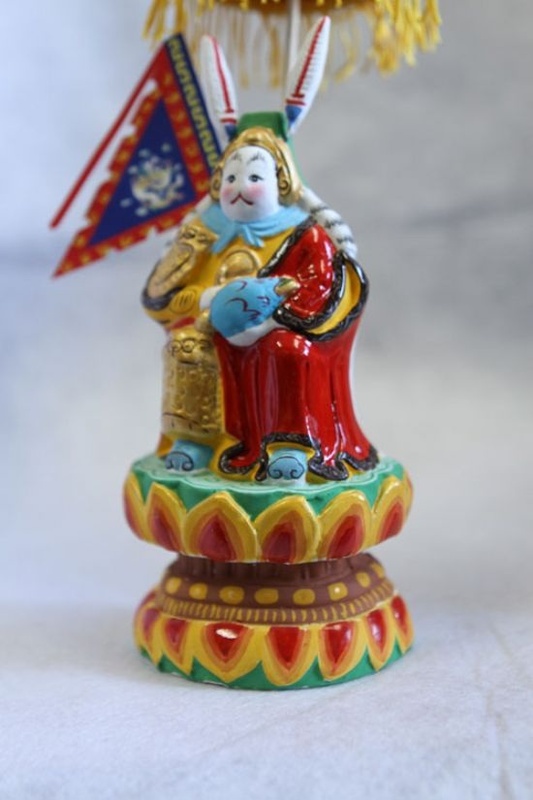 Kylin and tiger are typical auspicious animals in Chinese culture, all embodying the good wishes of the people. Since Rabbit God has been personalized throughout the ages, now there is also the Rabbit Goddess, who is supposed to be the spouse of Rabbit God. People treat Rabbit God as a person and so they created a wife for him — Rabbit Goddess.